Late planted sorghum is still causing considerable concern throughout north central Kansas as the leaves grow out of the whorl and are significantly ‘chewed up’ looking. 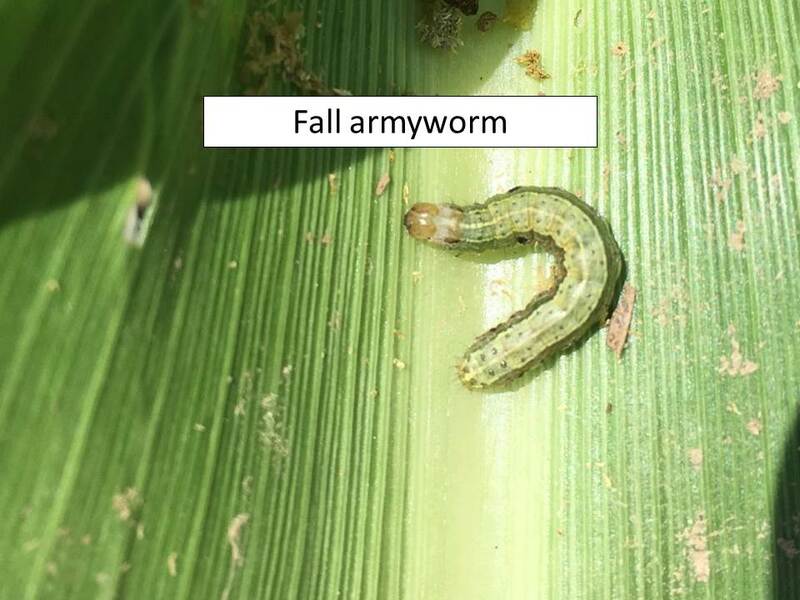 These ‘ragworms’, primarily corn earworms and fall armyworms but also a few cattail caterpillars, are still active in younger plants. As these plants reach reproductive stages, i.e. 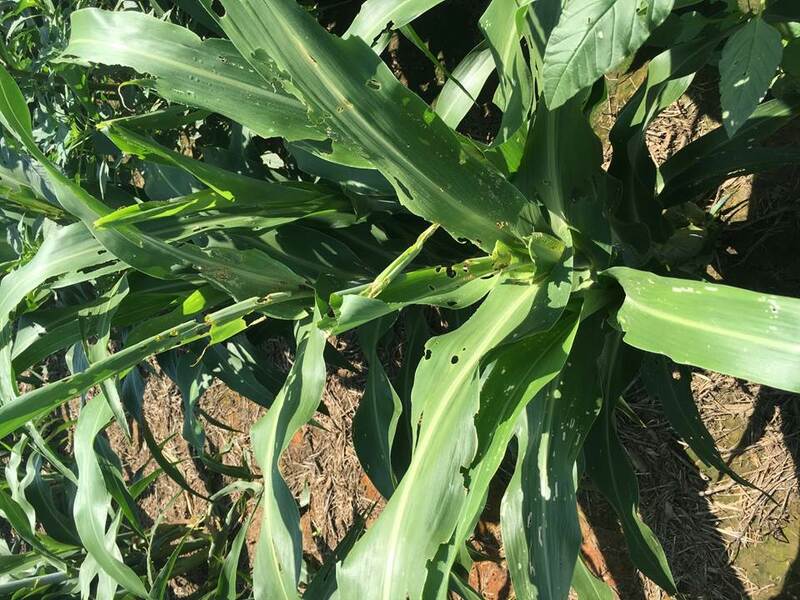 flowering, there will be a high probability of having ‘headworms’ (corn earworms and fall armyworms) infesting the kernels. Sorghum heads are the most vulnerable between flowering and soft dough. 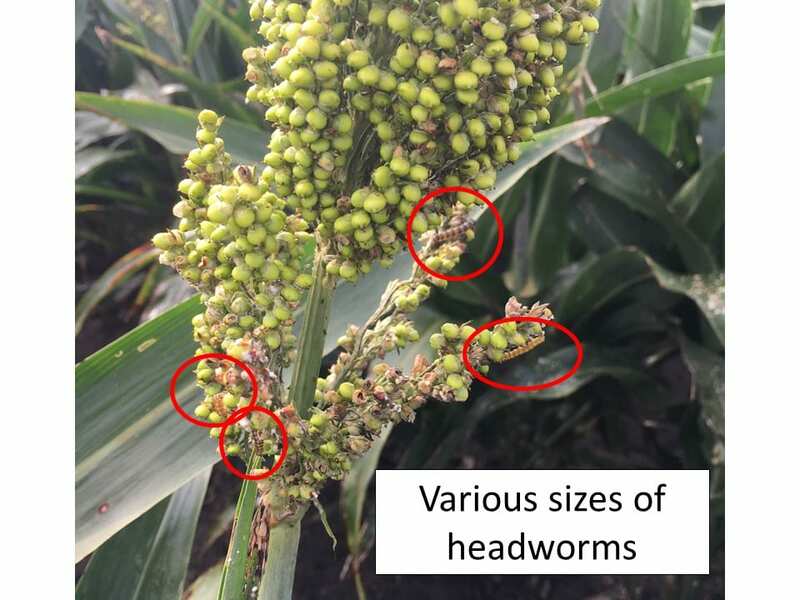 There are currently significant infestations of these headworms throughout north central Kansas with worms in various stages of development. Headworms cause approximately 5% loss per worm, per head. 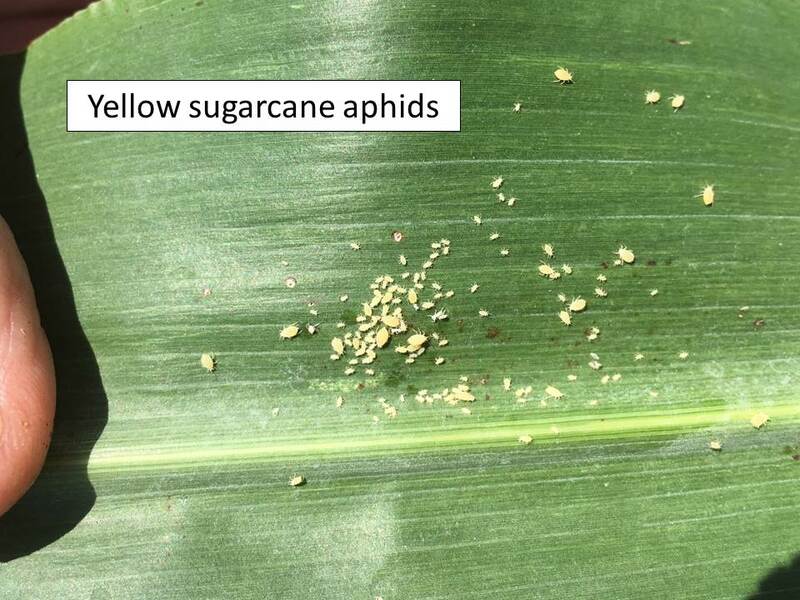 As we reach the midpoint of September, it is becoming clear that the impact of sugarcane aphid (SCA) in Kansas will be only a fraction of what it was in 2015 or 2016. Multi-state monitoring efforts using myfields.info to track SCA have reported SCA in 138 different counties in 8 states in 2017; the first record in Kansas was on August 1 in Sumner Co. You can track county movement by visiting the myFields distribution map, or sign up for an account to receive an email alert when SCA has been detected in your area. 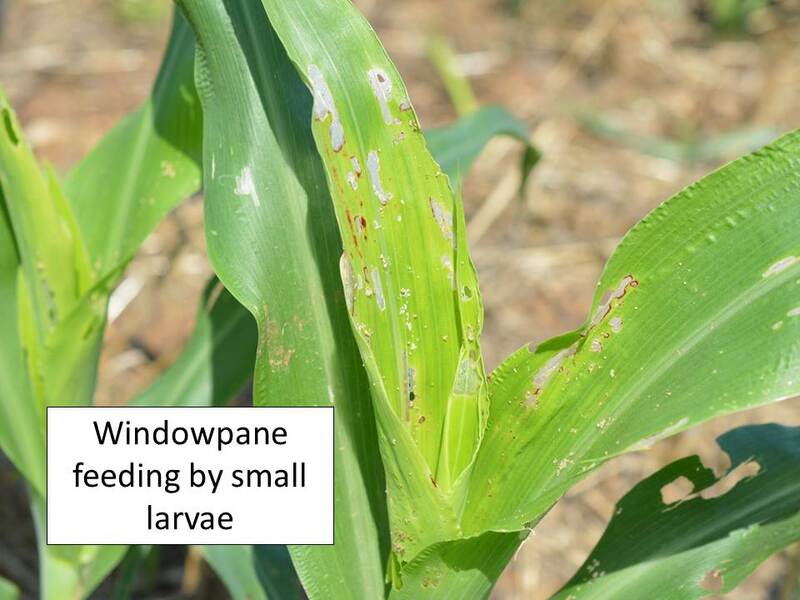 Only southwestern Kansas has had some fields with infestations heavy enough to warrant treatment, and many others have remained below threshold (see our Scouting Card for more information). A large proportion of the earlier planted fields are now mature enough to be safe from yield losses, even though SCA may be able to survive on these plants for some time. At this point, only the latest planted fields that have not yet filled grain remain at risk, and lower overnight temperatures are slowing aphid activity. Remember, SCA can survive overnight freezes and continue to feed on plants as long as they have any green tissue remaining, although without any further impact on yield if grain fill is complete. 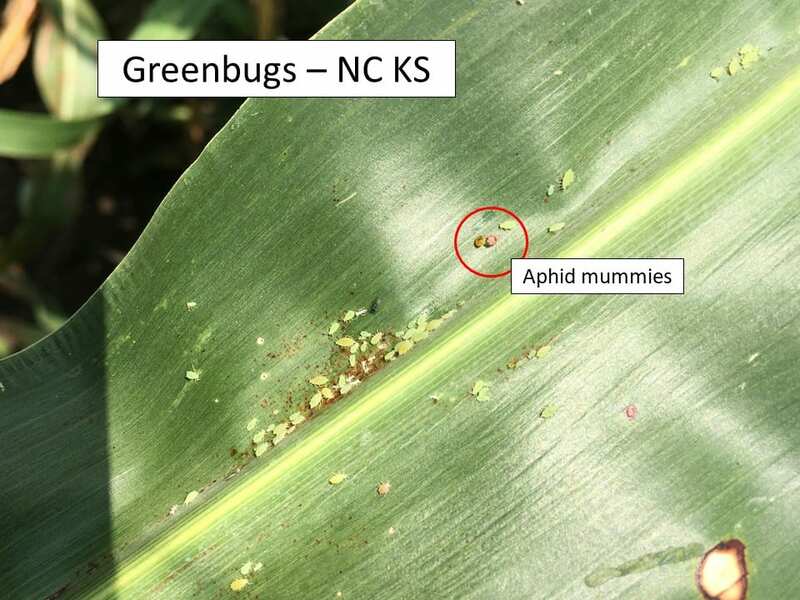 A substantial decrease in sorghum acreage this year, especially in the regions of central Kansas that were most affected in 2016, has likely impeded northerly movement of the aphid this year. 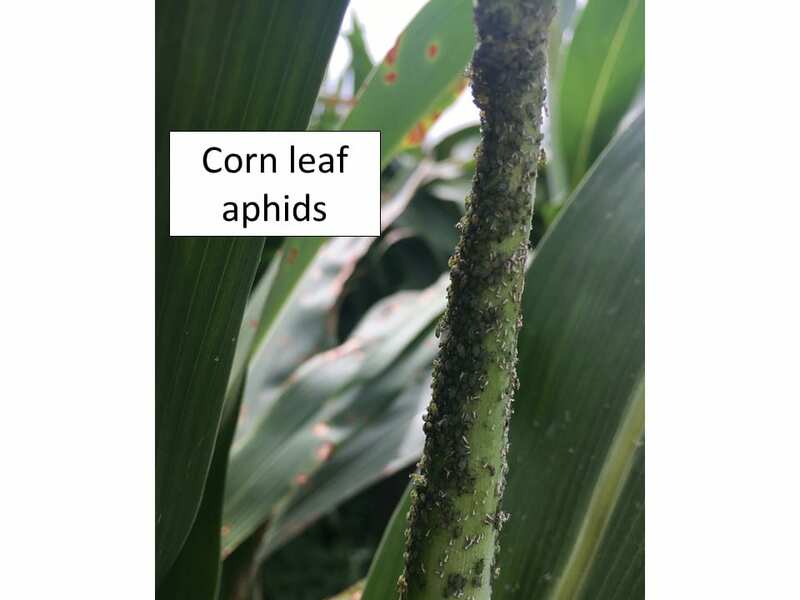 Reduced sorghum acreage, much of it converted to soybeans and dryland corn, has meant the aphid must traverse longer distances to reach suitable plants on which it can establish populations capable of producing the winged migrants that enable further spread. But several other factors have likely been even more important. Just as pest species can evolve new behaviors (for example, attacking a new host plant), so beneficial species can quickly evolve new pest/host plant associations. 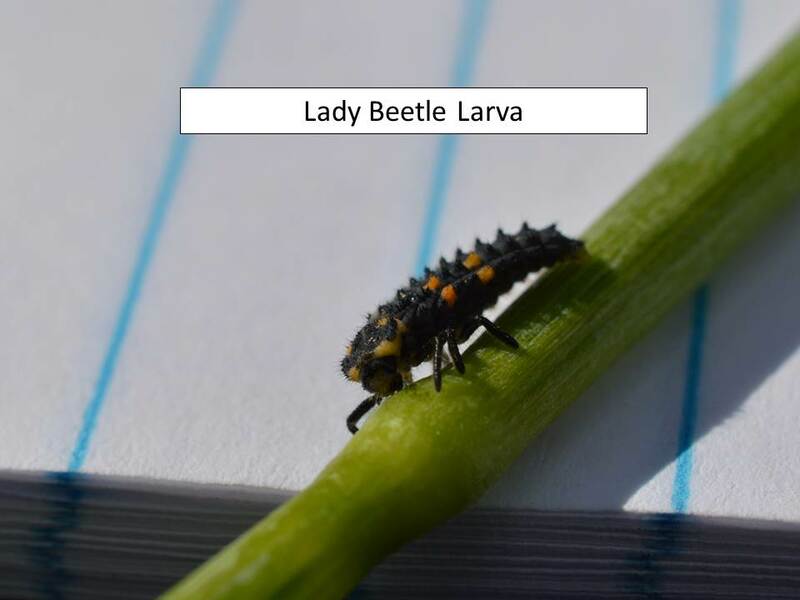 An example of this is provided by the Asian multicolored lady beetle, Harmonia axyridis, which last summer produced very large populations in Kansas sorghum for the first time, feeding primarily on SCA. This lady beetle was not found in sorghum previously, but was drawn into fields by abundant SCA, and is now responding to sorghum as a habitat containing many types of suitable prey. 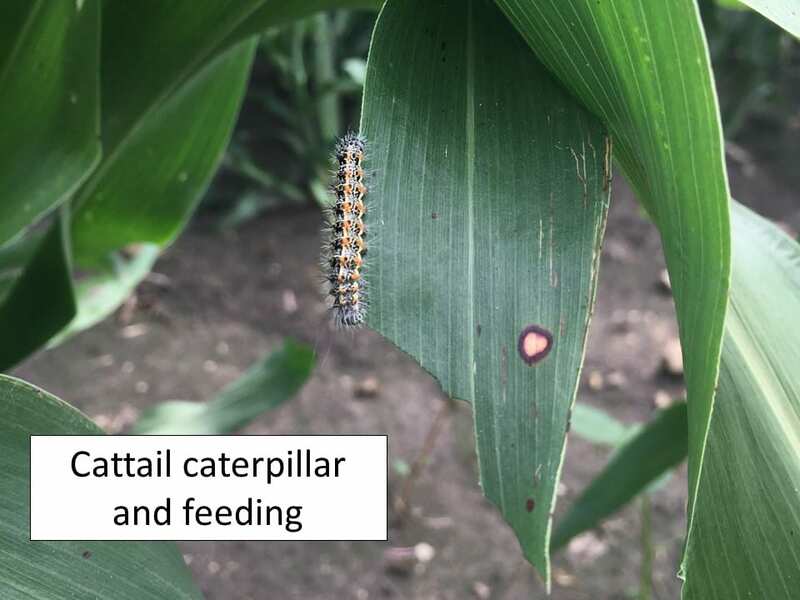 This year we have found it regularly feeding on corn leaf aphids and greenbugs, in the absence of SCA, something we had not previously observed. Similarly, H. axyridis did not frequent soybeans until the arrival of soybean aphid in 2002, whereupon it quickly became a key source of mortality for this aphid, and has remained a regular resident of soybean fields ever since. While the example of H. axyridis is quite obvious and visible, many changes in the responses of other aphid natural enemies in the sorghum agroecosystem are more subtle, but also important. For example, the greenbug parasitoid, Lysiphlebus testaceipes, appears to be gradually overcoming SCA immunity to parasitism, and we are starting to find some successfully mummified SCA. Aphid natural enemies are now colonizing sorghum faster, and in greater numbers, in response to SCA. 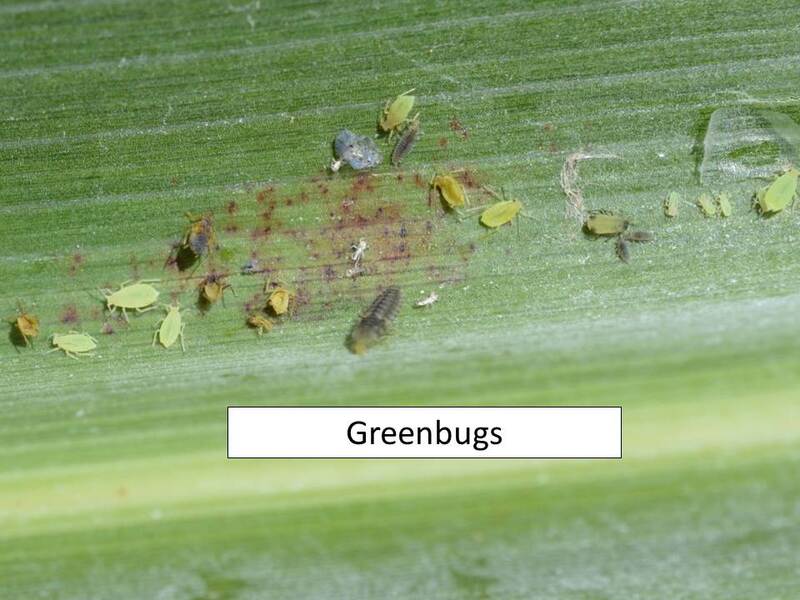 Surveys for SCA in central Kansas revealed many small colonies of greenbug, corn leaf aphids, yellow sugarcane aphids, and English grain aphids, all approaching extinction due to heavy predation and parasitism. Lacewings and hoverflies were especially abundant, with adults flying everywhere and several lacewing eggs on almost every lower leaf, independent of the presence of any aphids. In summary, we are clearly advancing from the epidemic phase of the SCA invasion to the attenuation phase, and considerably faster than we might have expected. Vigilance will be required for the next few years, and appropriate monitoring and management will need to be maintained, but it is quite possible that 2016 will mark the high point for SCA problems in Kansas and we will not see another year that bad again. A colony of sugarcane aphid showing evidence of substantial predation. Note ‘bloodstains’ (aphid hemolymph) along leaf midrib and the fact that aphids are widely scattered rather than forming a compact colony. Frequent rain over the last few weeks has played havoc with volunteer wheat control. Each rain seems to bring another flush of volunteer. This is an ideal situation for most wheat pests, i.e. 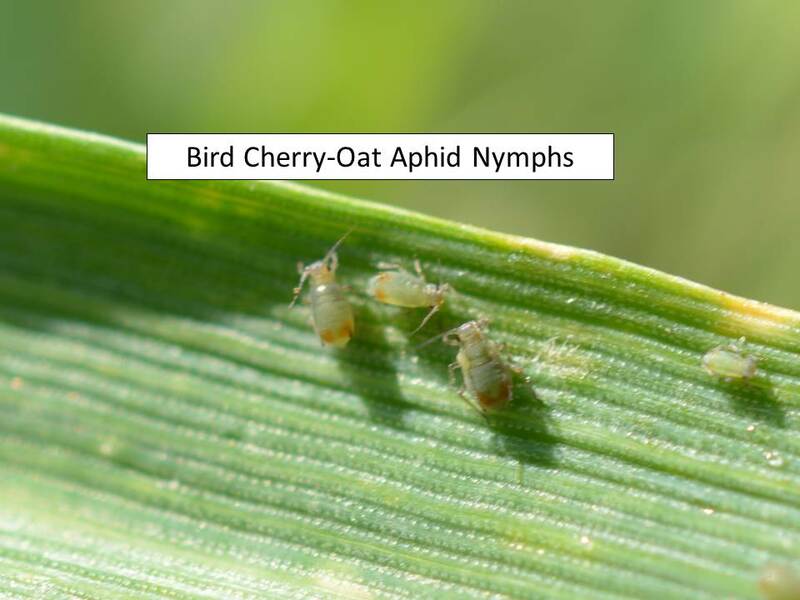 Hessian flies, winter grain mites, wheat curl mite, and the wheat aphids (mainly greenbugs, bird cherry oat and English grain) as well as the pathogens they may vector. Thus, please remember to destroy all volunteer at least 2 weeks prior to planting to help manage these pests. 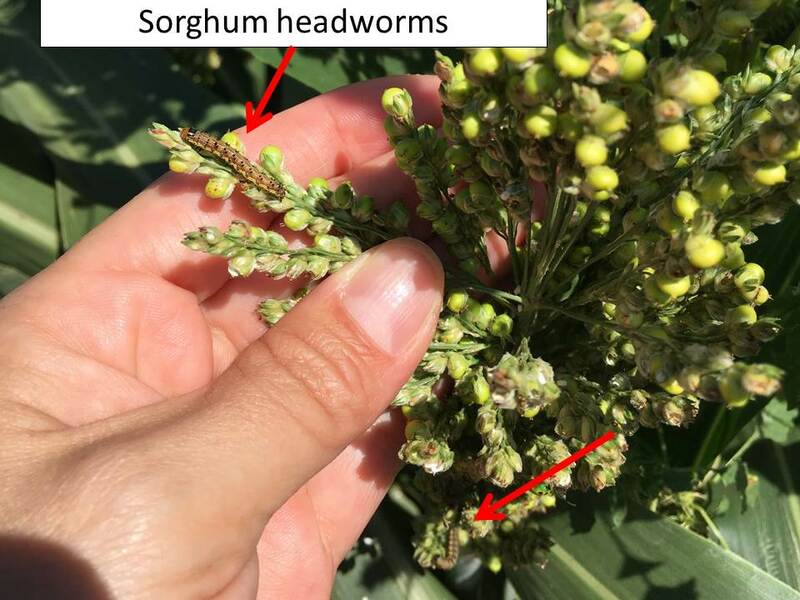 Much sorghum throughout north central Kansas is at least in the soft dough stage and thus has passed through the most susceptible stages for sorghum headworm infestations. However, any sorghum yet to head out will still be susceptible to these headworms as there will still be at least one more generation. 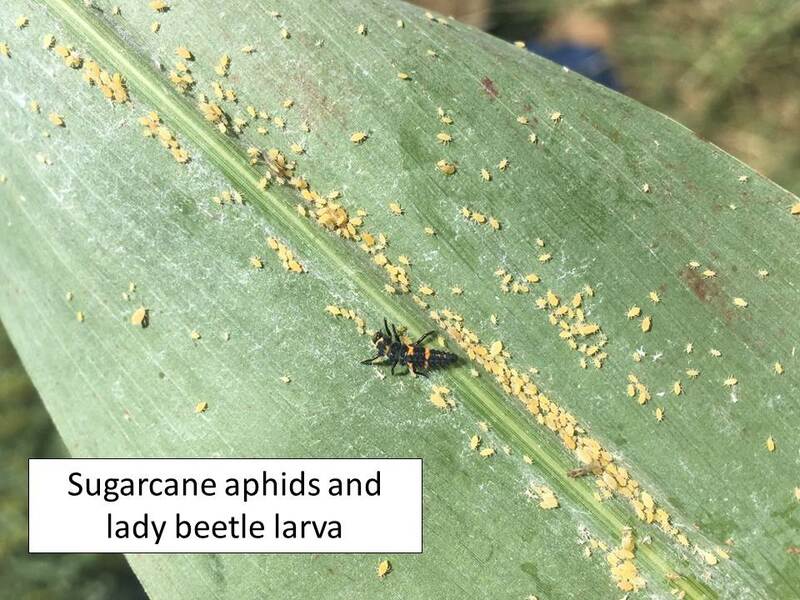 All four aphids species, corn leaf, greenbugs, sugarcane, and yellow sugarcane, are still in every sorghum field we sampled throughout north central Kansas. All populations seem to be increasing but there are relatively healthy populations of beneficials present as well. 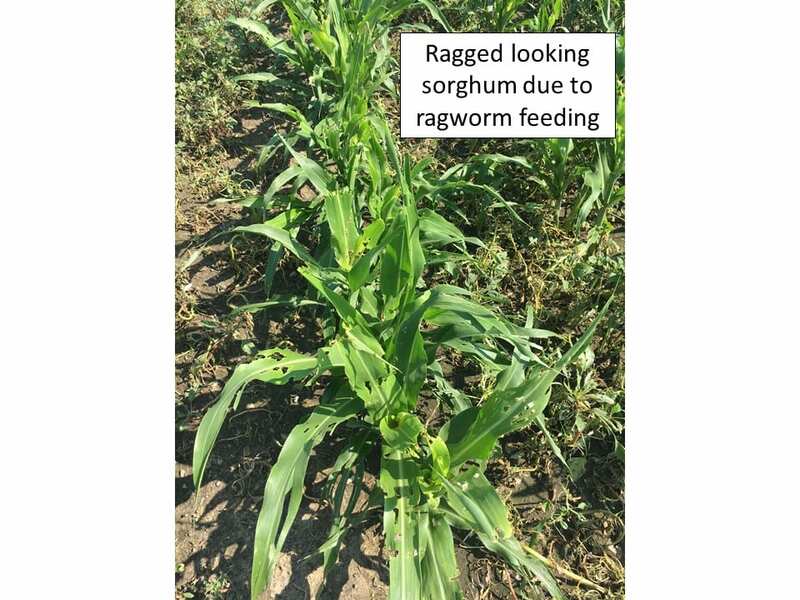 Double cropped sorghum may still have some ragworm feeding during the whorl stage (see photo). 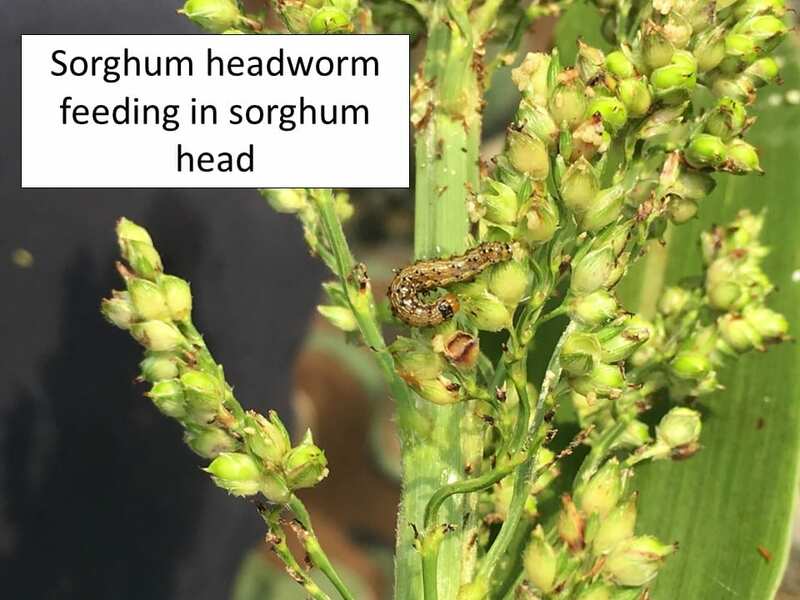 In addition, there will probably be at least one more generation of headworms and thus later planted sorghum needs to be monitored for headworms between flowering and soft dough when it is vulnerable. 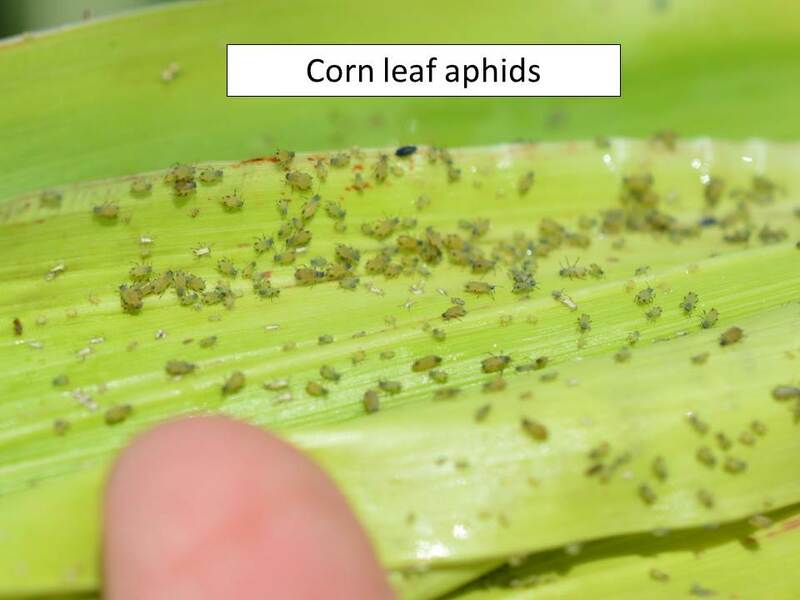 Also, continue monitoring for aphids as there still seems to be a pretty good mixture of greenbugs, corn leaf, yellow sugarcane, and sugarcane aphids. Some of the fields treated for headworms have reduced numbers of beneficials so they may not be there in sufficient numbers to help control these aphids. However, some of the fields sampled this week that were sprayed for headworms at least 2 weeks ago had pretty good populations of beneficials already building back up. 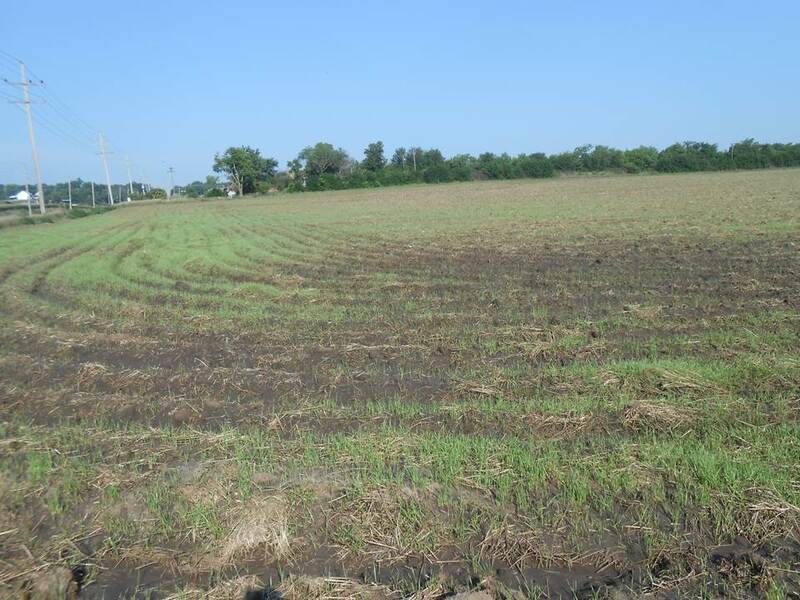 The situation seems about the same throughout north central Kansas with regard to insect pests. Still finding mixed populations of aphids (greenbugs, corn leaf, yellow sugarcane, and sugarcane) but beneficial insect populations (mainly green lacewings, lady beetles, parasitic wasps, and occasionally syrphid fly larvae) still remain plentiful. Headworms are also plentiful in just about every field that is not yet at soft dough. Remember, expect 5% loss/worm/head between flowering and soft dough. Chinch bugs, both adults and nymphs, are also plentiful at the base of most plants but can also be found feeding on young developing berries in the heads. 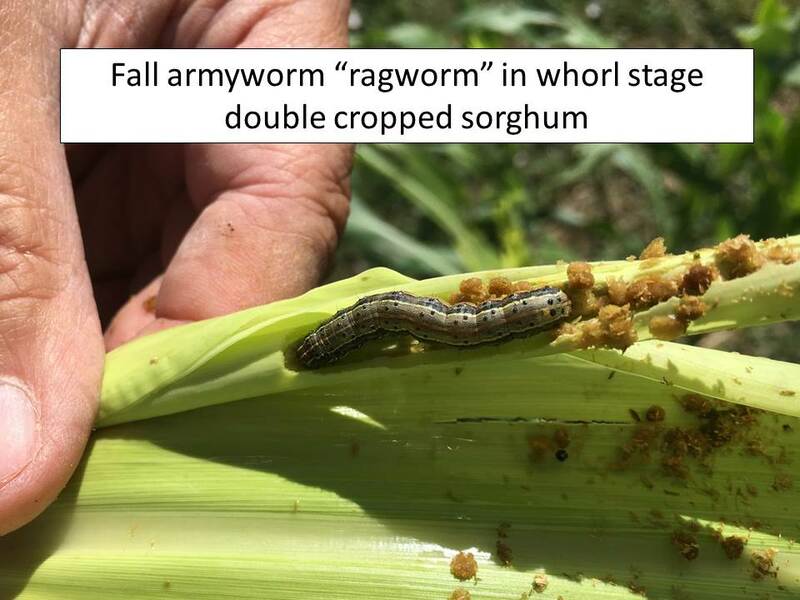 Double cropped sorghum in north central KS seems to have a significant infestation of “ragworms”. 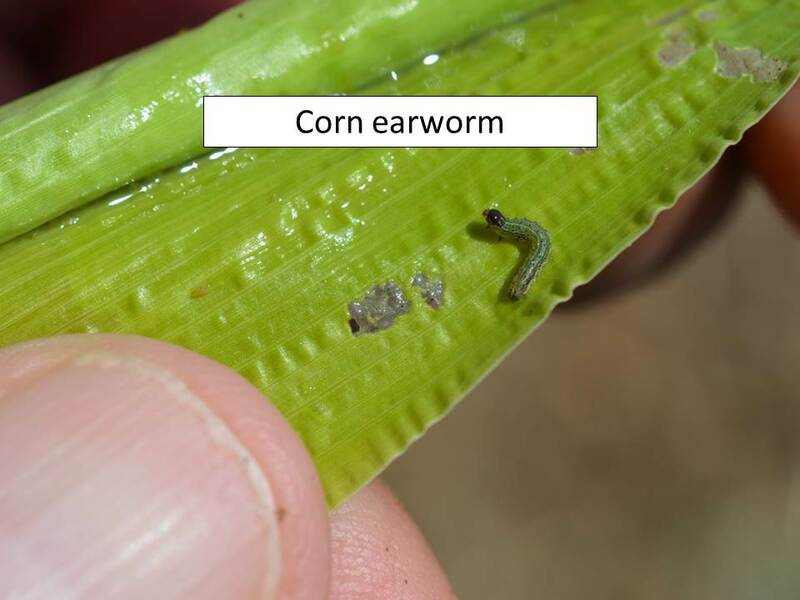 The larvae are a combination of fall armyworms and corn earworms and are of various sizes. Leaf feeding in the whorl by either species is highly visible but should not have a significant effect on the plants or yield. Also, most fields in north central KS are infested with aphids. Corn leaf aphids can produce a great deal of honeydew but mostly in the whorls. This honeydew may retard head extension but usually does not affect many plants over a large area. Also found greenbugs and yellow sugarcane aphids. 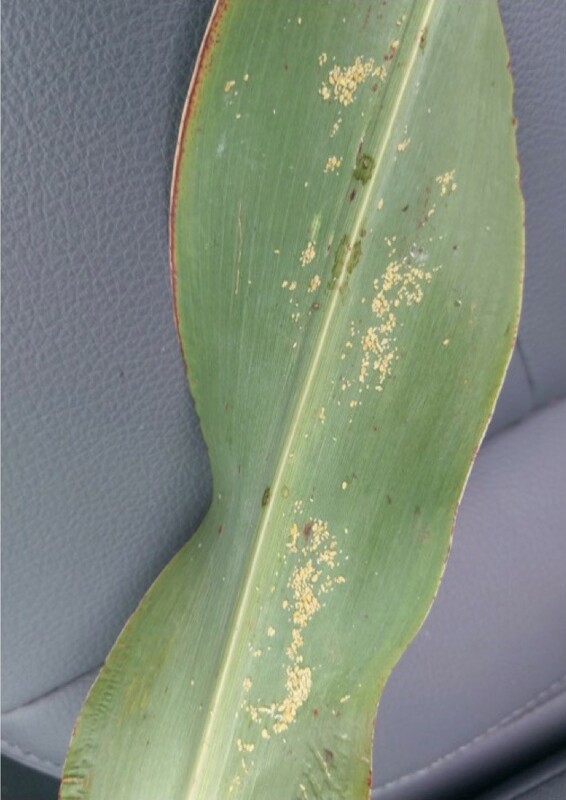 None of the invasive sugarcane aphids were detected in north central Kansas. 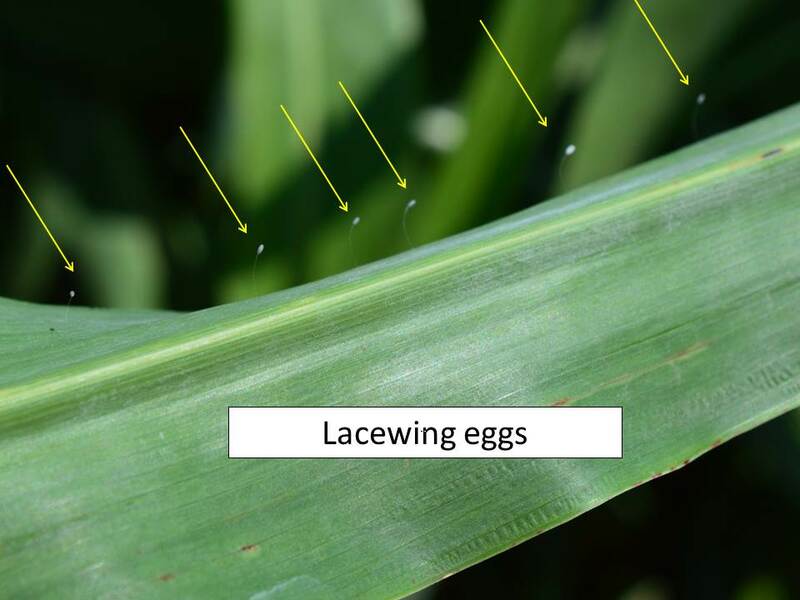 However, many beneficials are, and will continue to be, present in sorghum fields as evidenced by the numerous green lacewing eggs and lady beetle eggs. Wheat harvest is completed, or at least real close, across the State. So, it is time to start thinking volunteer wheat control. As wheat producers know, volunteer wheat is very persistent. Every time it rains or the fields are irrigated, another flush or crop of volunteer wheat germinates. Thus, control needs to be just as persistent. 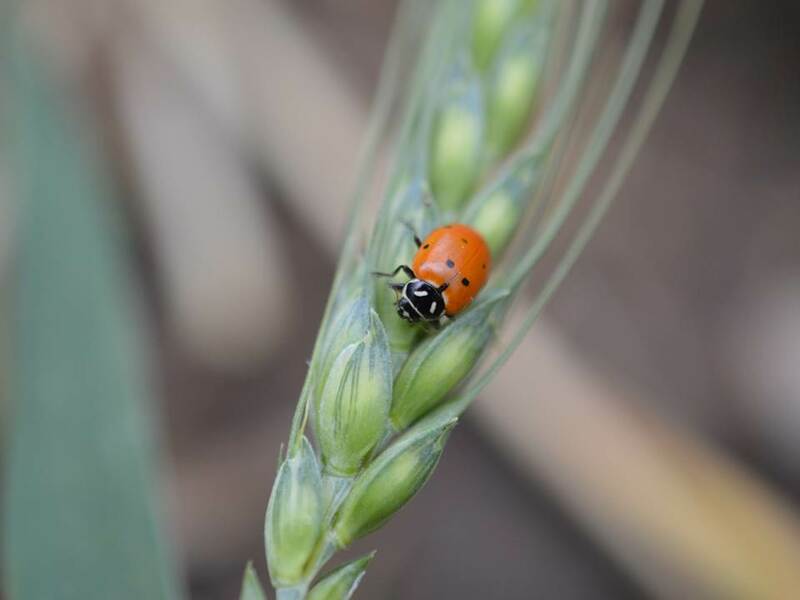 Volunteer wheat can be a harborage for most wheat pests, especially bird cherry-oat aphids, Brown wheat mites, English grain aphids, greenbugs, Hessian flies, wheat curl mites, and many of the more common pathogens. Season-long control is always best, but rarely practical. So, volunteer wheat eradication at least 2 weeks prior to planting is the next best management practice. 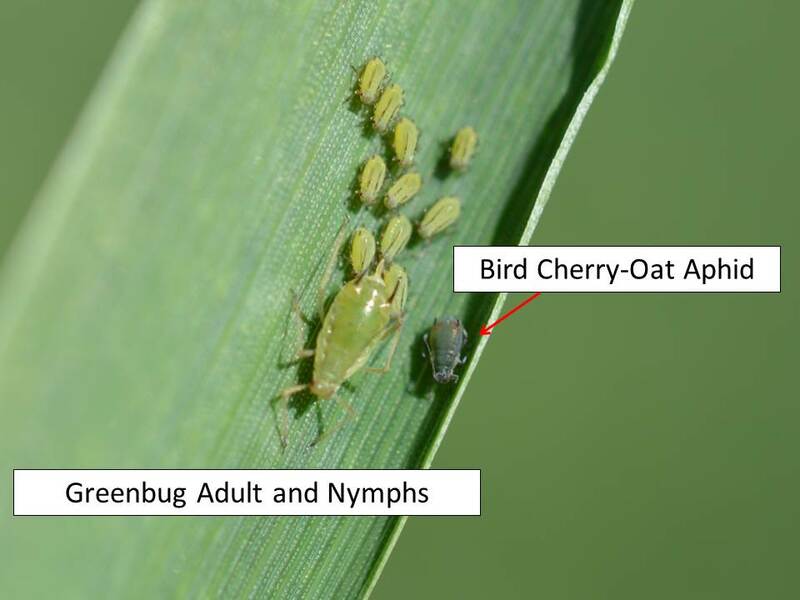 Wheat aphids, primarily bird cherry-oat and greenbugs, continue to migrate into Kansas on southern winds. The most common question this last week then is whether to add insecticide to a fungicide application to kill the aphids. 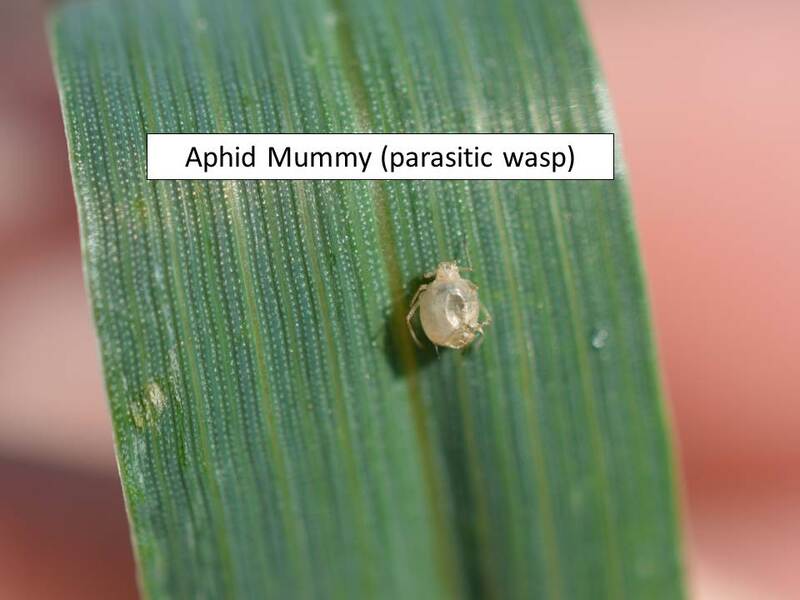 First of all, we do not recommend pesticide applications unless justified, and the mere presence of aphids in wheat does not justify an insecticide application. 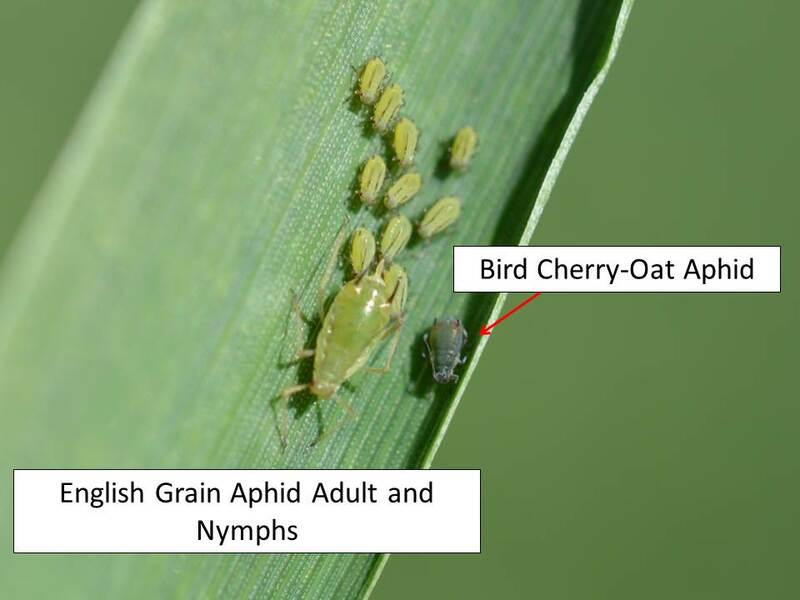 Aphids need to be at densities of 20+ aphids/tiller when wheat is in the boot to heading stages before aphids begin to impact wheat simply due to their feeding. Even then, their feeding is more impactful on plants that are already stressed by less than ideal growing conditions and when there are few beneficials present, i.e. lady beetles, lacewings, parasitic wasps, etc. Recent rains seem to have really helped alleviate the previous dry conditions- so growing conditions are not stressing the wheat. When an insecticide is added to a justified fungicide application, the insecticide will kill the aphids, as well as all the beneficials. The aphids will continue to migrate into the state but the beneficials will be gone and much slower to re-populate. Foliar insecticide applications made to control aphids with the aim of reducing the transmission of Barley yellow dwarf viruses has not been proven and thus is not recommended. 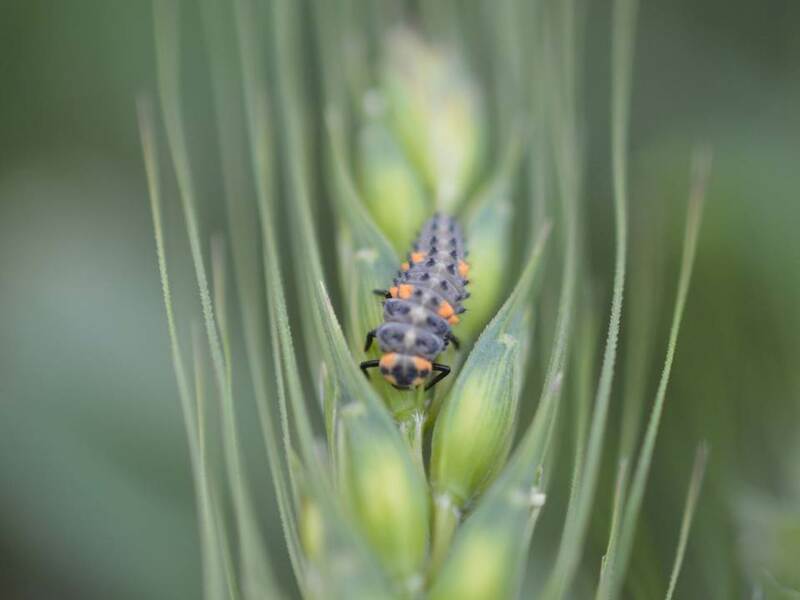 At the present time there seem to be good populations of lady beetles and parasitic wasps in wheat fields to help mitigate aphid populations.